TORONTO – That was a hard-fought victory for the Toronto Argonauts on Saturday night in front of a loud and rabid fan base that has been waiting nine months to see a regular season game at home. The first half was a slow, sloppy game, bogged by penalties with neither team taking the reins. Without the penalties against Saskatchewan the game might have been out of reach for Toronto in the first half. This was to be expected and Argonauts head coach Scott Milanovich even warned beforehand this is what we were likely to see. Why? 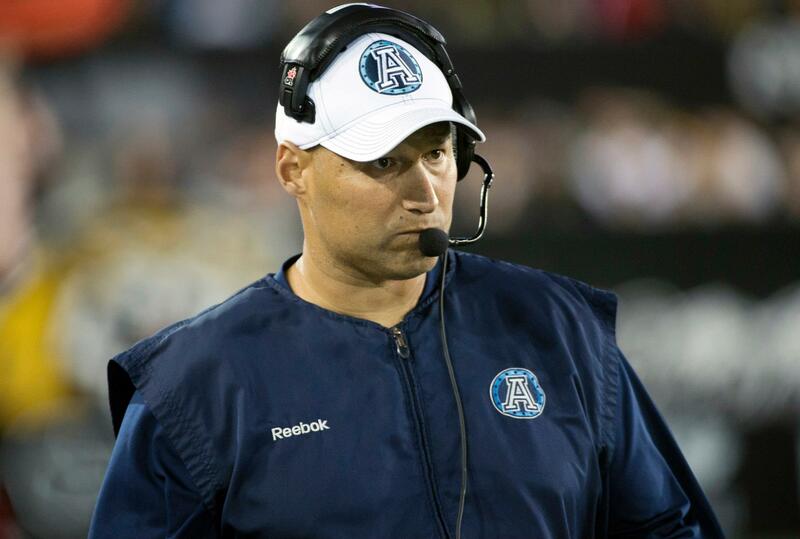 The Argos had just concluded a five-game road trip, with their last game only five days prior to Saturday’s home opener, a decisive loss to Hamilton at Tim Hortons Field. Toronto only had one full practice to prepare for Saskatchewan. In addition, the injuries have started to mount for Toronto. Starters who were not available to play on Saturday night included receivers Chad Owens and Anthony Coombs, centre Jeff Keeping, and linebacker Cory Greenwood. The Argos’ infirmary became more crowded on Saturday evening as receiver Kevin Elliott was injured during the first quarter and did not return. Did you get that? 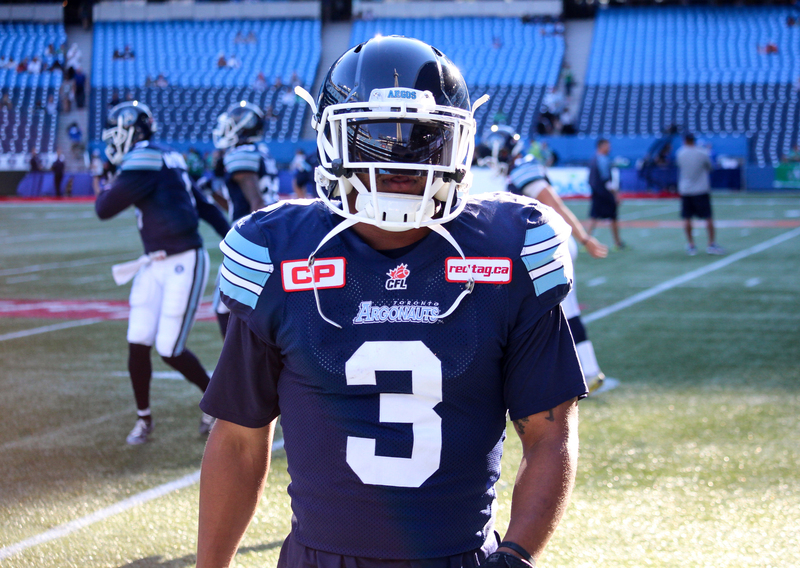 The Argos were without the services of four starting receivers. How they won is a testament to the make-up of this team. 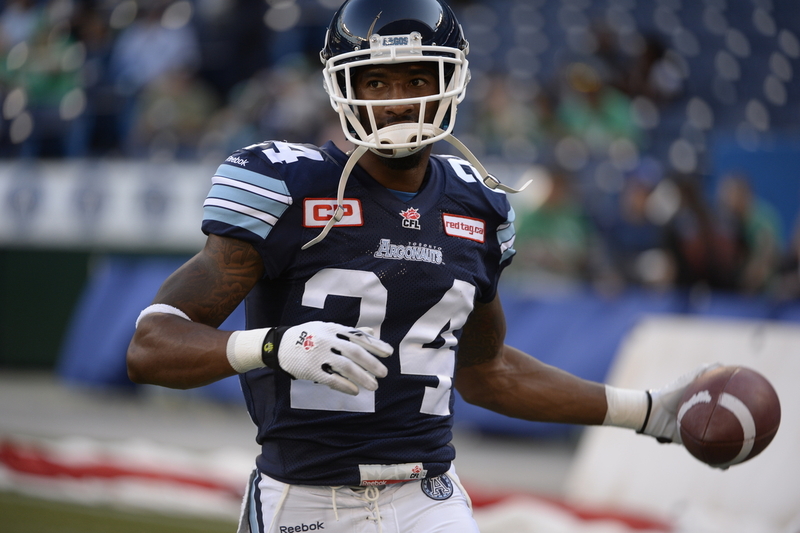 The “next man up” philosophy has been put to the test and the Argos are passing with flying colours. Their depth has been remarkable. Despite an influx of injuries and a horrendous road schedule, the Boatmen sit at 4-2, situated in a three-way tie atop the CFL’s Eastern Division. Discipline remains a legitimate concern for the Double Blue. 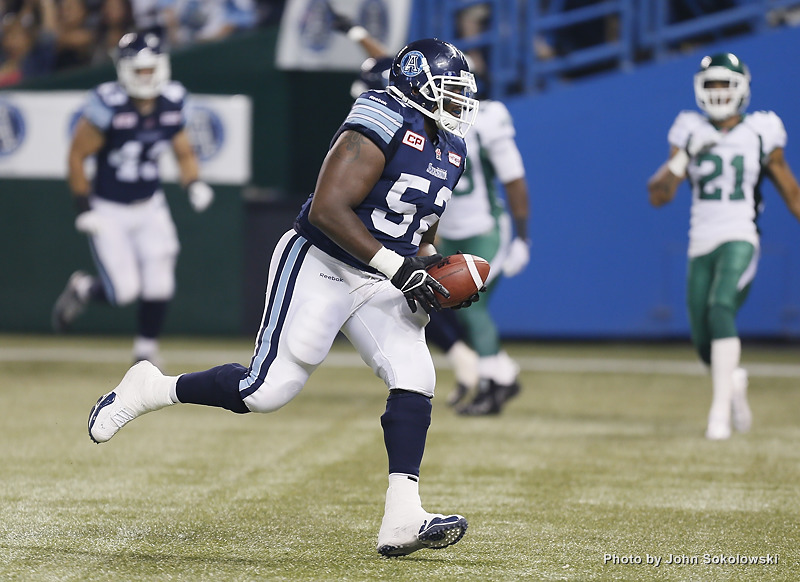 On Saturday, the Argonauts comitted 19 penalties. Unacceptable, but understandable on five days rest, and too many new bodies in the lineup. During halftime, the Argonauts made the necessary adjustments, understood they were still in the game and dug deep to come from behind in front of their fans to secure their fourth victory of the season. An interception for a touchdown by cornerback Akwasi Owusu-Ansah in the third quarter was the turning point of the game. 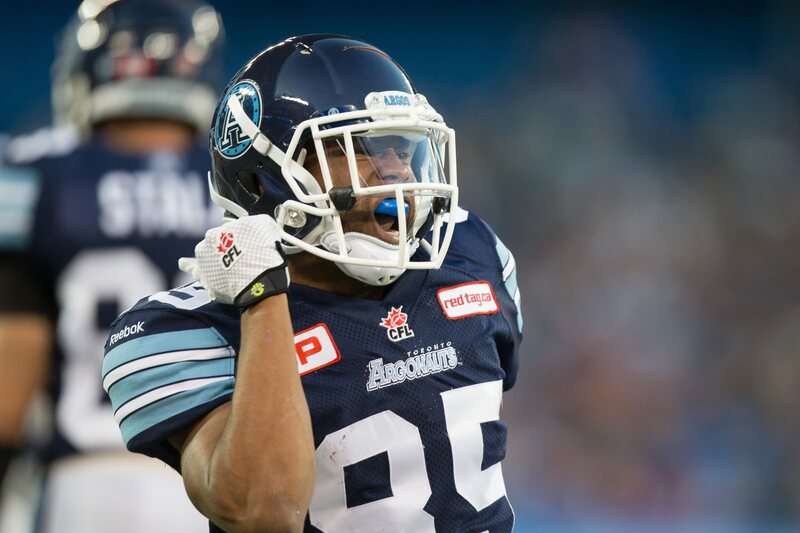 Momentum shifted in favour of the Argos and it got the crowd into the game. Quarterback Trevor Harris passed for over 300 yards once again, his fourth 300+-yard effort of the season. 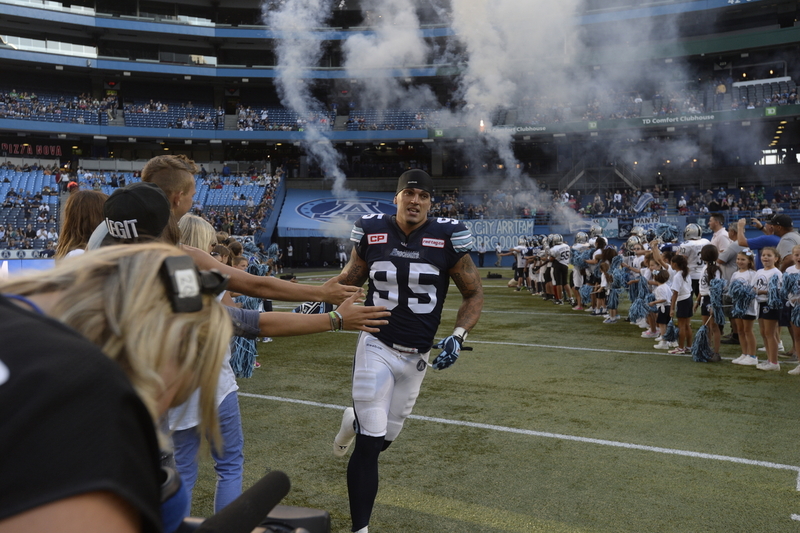 Rookie receiver Diontae Spencer, filling in for Chad Owens, had the biggest play of the game, an electrifying 52-yard touchdown that gave the Argos the lead in the fourth quarter. Rookie kicker Ronnie Pfeffer made a 52-yard field goal and made special teams tackles to save scores. The defence dug deep to stop Saskatchewan’s final drive short of a touchdown. 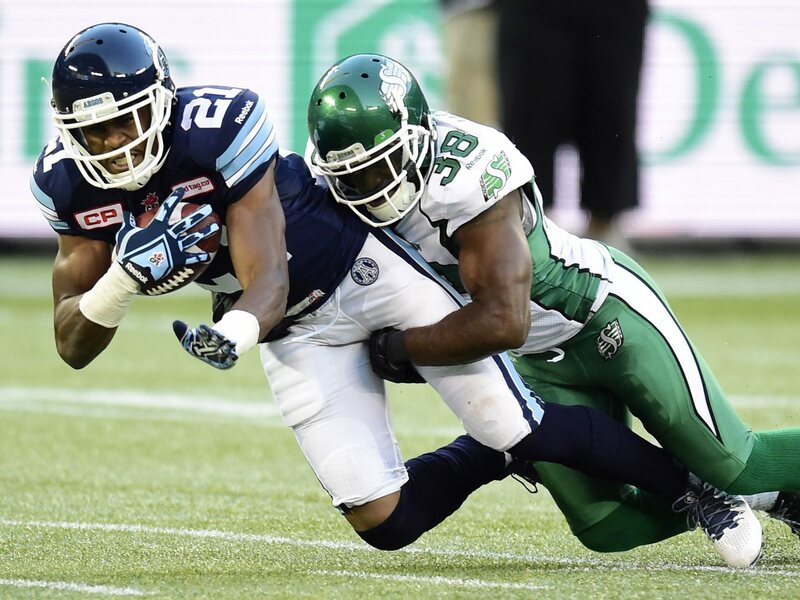 Saskatchewan played a tough game, trying to wear down the Argos’ defence, running the ball with success and their young quarterback constantly eluding Toronto’s pass rush. The schedule Toronto has endured is unheard of in professional sports. Start the season with five on the road. Have only eight home games this season as opposed to nine because of available dates at Rogers Centre. Play their first home game on only five days rest. To add insult to injury, if the Blue Jays qualify for the MLB post-season, the Argonauts will likely not be allowed to play at Rogers Centre much in October. Where will they play? We don’t know yet. It would seem events are conspiring against this team. So, what is the teams response? Win! Let others sort that stuff out, they will play you on the field, they will play you in the street, they will play you at sea, they will play you in the air. It does not matter to them. This is their finest hour to quote the greatest person of the 20th century, Winston Churchill. Now that the season is one-third complete, it is a good time to evaluate how they are doing. Let’s start with the most important position on the field: quarterback. 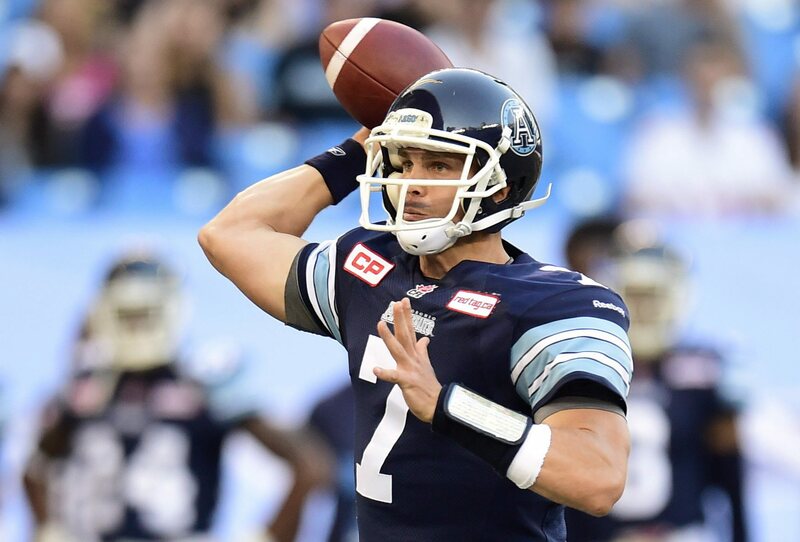 When it was known Ricky Ray was not going to be available to start the season and likely for a while, the job fell to fourth-year player Trevor Harris. It became his team and his time to show what he could do. The result? Harris has the highest passer efficiency rating in the CFL (115.4). He boasts a league-best completion percentage of 75% and ranks first in touchdown passes with 14. However, statistics do not tell that he has guided his team to a share of first place while throwing passes to rookie receivers and injured veteran receivers. He has guided his team from behind in three of the team’s four victories. He has worked hard to earn his opportunity and is making the most of it. So why not an A+? The two losses are against the two teams that played in the Grey Cup last year, Hamilton and Calgary. Those are the elite teams in the league and he must demonstrate he can beat them. The Argonauts do not have a league-leading receiver even though Trevor Harris is the leading passer. They have four receivers capable of being league leaders: Vidal Hazelton (383 yards), Tori Gurley (303 yards), Kevin Elliott (303 yards) and Chad Owens (284 yards). They all have the same numbers. Talk about a balanced attack. Other teams cannot double team anyone because they will pay the price. And the depth behind these guys: Diontae Spencer, hero of the last game, Dave Stala, and Natey Adjei. Unfortunately, they have lost All-Star slotback Andre Durie for the season. Owens missed the last game, while Elliot departed due to injury. Where the room for improvement needs to be is in discipline. They are taking some questionable penalties due to their youth and have missed some catches. Clean that up and a healthy Chad Owens and this team is scratching the surface of what they can produce. This has more to do with the team than the individuals. The Argos are a passing team, and they have played from behind in all of their games except their season opener in Fort McMurray, Alberta. They have been unable to establish a strong ground attack and have had to go to the air to comeback in their games. Having said that, the tailbacks have provided excellent pass blocking and have been contributors in the Argos’ victories. All-Star centre Jeff Keeping has been out for most of the season leading to a rotation by some new faces who have stepped up. Veterans Chris Van Zeyl, Jarriel King and Wayne Smith have anchored the Argos’ offensive line, along with newcomers Gregory Van Roten and Bruce Campbell. Together they have provided protection for Trevor Harris to move the ball downfield. It will be fun to see how they play when they can run block with a lead to help close out games. 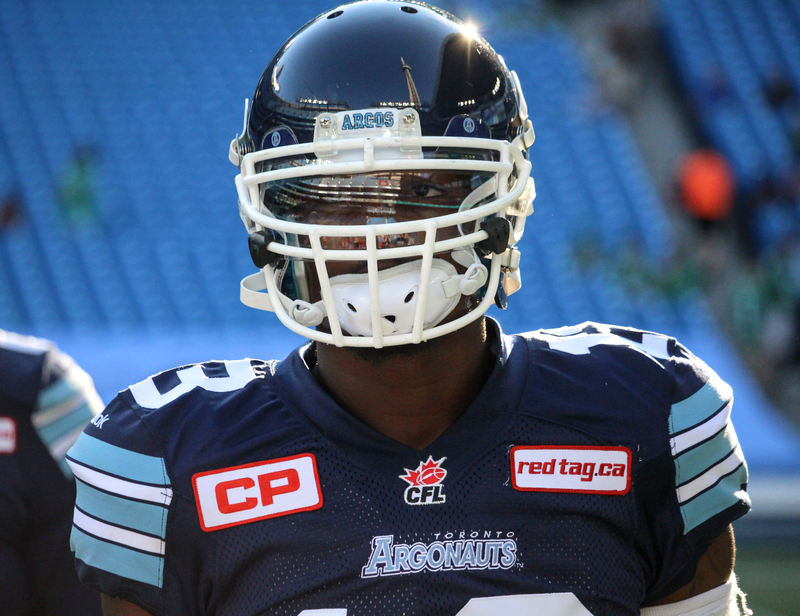 Greg Jones ranks second in the CFL in tackles. First-year starter Cory Greenwood is playing like an All-Star and veteran Brandon Isaac is providing strong leadership. Brian Rolle and James Yurichuk rotate in and provide big plays. With strong defensive linemen and an aggressive secondary, the linebackers can wreak havoc, blitzing and clogging up the running lanes. Two pick-sixes have been game changers in two wins against Saskatchewan. Injuries to safeties Jermaine Gabriel and Matt Black have not slowed the unit down. Replacement Vince Agnew is a starter in his own right. They are a young, aggressive group that make some mistakes but make up for it with game-changing plays. The upside is huge for a group that includes Devin Smith, Travis Hawkins, A.J. Jefferson and Akwasi Osuwu-Ansah. No league sack leaders, but the team leads in total sacks. Cummings, Foley, Waud, Laing, Vega and Okapalaugo have 16 sacks amongst them. Ricky Foley says they still have not put in a top game yet. It has been a long time since an Argonaut team has boasted this type of defensive line talent. Once the defence gels and injured players return, it will be exciting to see this line dial it up and pin their ears back. Rookie Ronnie Pfeffer out of Laurier won a tryout once All-Star Swayze Waters went down. He has kicked 52 and 50-yard field goals, and he makes tackles! He has kept them in games and not been the cause for losses. You cannot ask for more. Once Waters is back into the fold, the Argos will have the best kicking game in the league. Coverage is solid. Making Brandon Banks a non-factor in a game is almost impossible and they did it in a hostile environment. Not much going on here and the weakest part of the team so far. Bright spots and hope for optimism with a healthy Diontae Spencer and Chad Owens. Scott Milanovich gets the most out of his players. Rookies and veterans alike learn his systems, are motivated, stick to the game plan and never get down on themselves or their teammates. They don’t worry about playing on the road. They play the way they need to on the road, sound defensively and ball control on offence with few turnovers and high percentage plays. You may have a sports writing job waiting for you when you retire from finance.